Literally minutes after we were tipped off to the existence of an LG G4 benchmark pass through GFXBench, we now received word that the other major flagship in the making, the Sony Xperia Z4, has suffered a similar fate. According to the listing, a device code-named Sony E6553, quite likely the Xperia Z4 (more on why later), ran GFXBench's suite of tests, revealing quite a bit about itself. For starters, Sony seems unwilling to jump on the display resolution bandwagon, and is sticking to a 5.1-inch display with a standard, 1080 x 1920 pixel resolution. Underneath the panel, GFXBench detected a 64-bit, octa-core Qualcomm Snapdragon 810 processor with four ARM Cortex-A57 and four Cortex-A53 cores, Adreno 430 graphics, 3 gigs of RAM, and 32GB of storage. Also on board is a 20-megapixel main camera and a 5-megapixel selfie shooter. The device in question runs on Android 5.0.2 Lollipop. Going back to why we consider it likely that this is, indeed, the Xperia Z4, it's rather simple. First off, the hardware packed within the E6553 is consistent with what we'd expect a flagship device to offer in 2015, and second – the code name itself lends some further credibility to our educated guess. That is, this isn't simply a random alphanumerical mash-up – the capital letter in the front ("E" in this case) shows the year of manufacture. So, for example, the Xperia Z3 was D6603 and was released in 2014, while the Xperia Z was C6603, and got released in 2012. 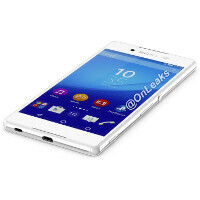 These two factors, more than anything else, suggest that what we're looking at could be the first legitimate specs reveal as far as the upcoming Sony Xperia Z4 is concerned. We finally got some official specs on the Z4. Looks good in general. Yeah it's going to be great as always. But the Samsung has spread lots of rumors about the SD810, just to reduce competition from other manufacturers. Here we go again everytime Sony has a leaked a lot of haters appear in this site. Most of them being samsung and apple fans. I admit that in terms of camera Sony has problems with algorithms but what else do they have problems with? Battery life? Display? Oh please don't give that quad HD is a must cause apple never uses quad HD and look how apple user wall hugged every outlet. In terms of functionality and durability Sony flagship have it. I cannot find anything about the consumer G Flex 2 overheating. Literally just the opposite, that any (supposed) overheating must have been fixed, as the phone performs to spec. Please could you link a source? I'm really hoping that they'll use the Cybershot technology on this phone. Their point and shoot cameras are so underrated but very good. whats that port beside the charger? usb c? I'm quite worried about the Snapdragon 810, it's basically an epic fail for Qualcomm. I do hope Sony will find a solution to prevent the overheating or just use Snapdragon 808 or maybe other chipsets like Kirin 930 or Exynos 7420 or MTK 6795. Didn't Qualcomm fix the overheating issues? May be or not. As we saw reports (rumors) saying M9 still have issues. Just watch any of the M9 reviews on youtube. They all adress the issue and say there is no overheating. And they also talked about the increased throttling since the latest software update. Sony should go with 808, SD 810 will overheat in a waterproofed Z4 much more than it does on the m9. 808 is basically 810 without two A57 cores and much weaker graphics. 808 is basically 801's equivalent. If you read the Anandtech article, you will notice that they clearly mentioned HTC doesn't allow the SOC to touch 2.0GHz as advertised. "However, using CPUBurn to try and load just a single thread reveals that without HTC’s CPU cheats, it’s basically impossible to get the A57 cluster beyond 1.5 to 1.6 GHz." "This benchmark mode appears to relax throttling constraints, but more obviously it enables one to go from a maximum of 1.6 GHz to the rated 2.0 GHz of the Snapdragon 810 for extended periods of time." It's pretty clear they are under-clocking the CPU and using more aggressive throttling to find a solution. Perfectly logical solution, but it hardly proves that the issue with 810 SOC has been resolved. It's just that vendors will now underclock to make it to *work*. You didn't think they were going to be honest? They are not willing to sacrifice revenue or business. Is the model of most, deal with the consequences later. Feel free to ignore the end that attempts to start pointing fingers, personally, I'm not interested in that rubbish at all. Horrible article altogether. I was already suspicious of their claims before the first SD810 3rd party tests, but now it's really just sad. What's ironic, is the fact that it claims Samsung is spreading FUD, while the real FUD, is in that article. Could I ask what it is you take exception to in that article? (Ignoring the finger-pointing ending if you please... as he recommends to do our own research on the source of 'leaks', but I have and will not). Personally I can't find fault with the assertions that; a) the early 810's had an issue that would be corrected in later die spins. b) many supposedly reputable news publications didn't bother giving the issue more than a cursory glance before parroting the claims. c) the G Flex 2 was reported by multiple sources not to exhibit any issues or suffer performance hits due to underclocking at CES or since. This is not to take anything away from any claims that performance isn't as big a leap as they'd like, simply that an overheating rumour didn't deserve to be constantly perpetuated. I played with M9 for an hour and yes it does has overheating issue unlike M8 plus a bit laggy unlike M8. You should really, REALLY, stop using that BS article to defend SD810. This SOC has HARDWARE issues, documented by alot of different, knowledgeable websites, like arstechnica, that CANNOT be corrected with just software patches. Only thing left for the manufacturers that using it, is to underclock it and basicly loose the speed advantages compare to last year SOCs, let alone the new Exynos. Please stop spreading B.S. I'd like to stop spreading misinformation so as you named them specifically, could you point me to a recent (i.e. since the publication of the semiaccurate article) post by ars where they don't just cite the bloomberg report about Samsung switching to inhouse, or 'straight-from-the-source' rumour blog posts about preproduction 810s running hot? Their review of the M9 states it throttles aggressively, which fits with the anandtech review, but I can't find sites having problems with the G Flex 2 for example. So wouldn't that point to it being a problem with HTC's implementation? Anyway, that is the first and only time I posted the semiaccurate report, conceeding that I feel his assumptions at the end are disingenuous, I shalln't be posting it again as it's conclusion is a bit too much like bait for a flame war. Exynos 7420 is way to go for Sony...huawei and mediatek are lazy to update firmware for future android release. I really don't think that Sony's going to be using a Samsung chip.